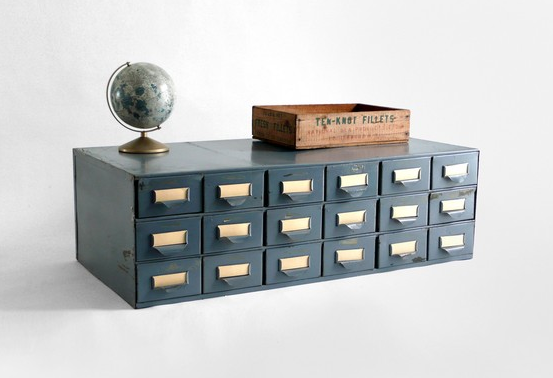 Find of the Week: Vintage Card Catalogs! 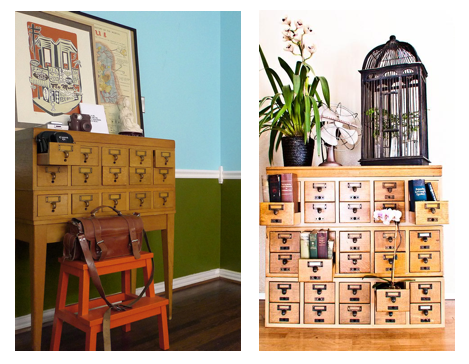 Vintage card catalogs are pretty popular amongst the design-blog set these days, and I can see why. This now iconic and stunning makeover from the super adorable husband/wife team at Young House Love is burned into my brain. Below, these two are equally fabulous in their own way. I love them both, and especially love that they’re not the standard shabby chic distressing job. Very Mid-Century Modern! On the left is a great "find" from a Texas flea market via Design Sponge, and on the right is a simple and clean vignette from Poetic Home. It probably goes without saying that hunting down a massive old card catalog is a huge project in itself, and the work it takes to get it into proper condition is a whole different challenge. 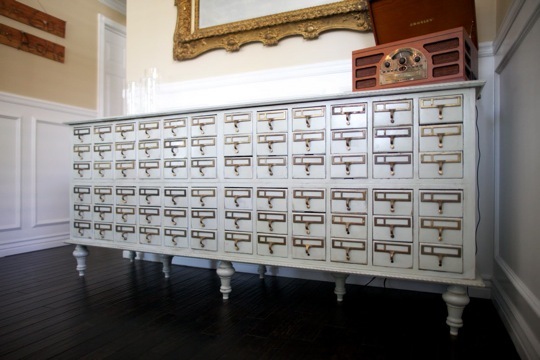 So, I thought that this cute, smaller card catalog from Etsy seller Hindsvik is a great compromise. Bold, unique, and versatile, there’s likely room for it or something like it in your home. It’s priced at $325, plus a wholelottashipping I’m guessing — still, it’s worth it! LOVE these. I need one!! !